If you are looking for the ultimate home automation solution, you need to check out what HAI has to offer. I’m currently installing a OmniPro II in my new home and there is nothing my house won’t be able to do. Imagine coming home at 10 o’clock at night, the system knows the time, when you open the garage door the system turns on certain lights to guide you to your bedroom. After the system notices no movement in the home, via motion sensors, the lights turn off. This is just one example of how a properly designed and integrated home automation system can work. The OmniPro can control your HVAC, Lighting, Security, and almost anything else you throw at it. 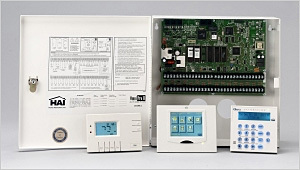 If you are in the market for a home automation system, you need to look at HAI very seriously. Contact me directly if you have any questions, since I am a user and a big fan. Understanding Home Automation, Part One.